You don’t realize this as you tuck into that breakfast, but India is in the throes of a grand culinary experiment. What are you eating, by the way? Is it a dosa, paratha, samosa, brun maska or luchi? Your answer could determine the future of your favourite dish. Why do some dishes travel so far from their origins and why do other dishes stay locked within a region? Take the pizza, for example. It originated as a Mediterranean flatbread. The term was probably first used in 10th century Italy. After World War II, American troops brought it back home; the franchises took over, and the dish has taken over the world. We have Brazilian sweet pizza with fruit toppings, Israeli kosher versions, and toppings reflecting the nation, such as bulgogi, tandoori chicken and sambal paste. 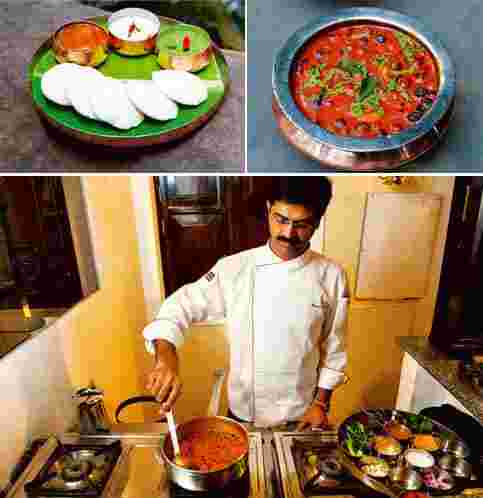 Essentially Tamil: (clockwise from left) Idli, easy to cook and pronounce, has travelled well, but not vathal kuzhambu (below); and Naren Thimmaiah, executive chef, Gateway Hotel, Bangalore, shows us how to make vathal kuzhambu. Photographs by Aniruddha Chowdhury/Mint. Consider, in contrast, the humble vathal kuzhambu, from the Tam-Brahm heartland of Thanjavur district. It uses primarily two ingredients: dried vegetables, called vathal; and lots of tamarind water. The vathals are simmered in tamarind water till the gravy becomes thick. Spices such as asafoetida, salt and chilli powder give it flavour. I am simplifying the recipe, but you get the picture. My question is this: Why did a recipe that originated in Iran take over the Indian subcontinent while a far easier recipe with far fewer ingredients failed to travel beyond its borders? In other words, if a Tamilian can eat a samosa, why don’t Punjabis demand vathal kuzhambu? It is a dilemma that would do Darwin proud. The evolution of dishes; survival of the tastiest; cross-border migration; deep-fried or else you are out. Common wisdom holds that the reason Punjabi dishes have spread all over India is because they travelled the road with Punjabi truckers. Then why hasn’t the supposedly ubiquitous Malayali tea-shop owner cooked and sold his appam and stew wherever he set up shop? If demand drives markets, why isn’t there a market for kori gassi, sabudana vada, sarapatelor yakhni? Some of it has to do with marketing. While the dosa and sambhar that I eat four mornings a week (if I can) is known to all my Punjabi and Gujarati friends, who modify it with pinches of garam masala and sugar, respectively, no Tamilian has marketed the vathal kuzhambu. The name itself is pretty difficult. Here I come to my core theory of culinary supremacy. It’s all in the name. Any dish with more than three syllables is doomed. Dharwad people sing the praises of badane ennegai (stuffed brinjal—seven syllables) but do you think it stands a chance next to the four-syllable baingan bharta? Do you think a Dilliwala can even pronounce a mezhukku varati, let alone desire to order it? Do you think a south Indian like me can memorize kobi bataka nu shaak as compared with a short and simple dhokla? You Mumbai folk might be able to say patra ni macchi with elan, but I tried ordering it for a friend and didn’t get beyond the patra, which is a leafy “ghaas-phoos" (vegetarian) dish made with Colocasia leaves. Want to predict the future of Indian dishes? It’s all in the name.